Hello friends! 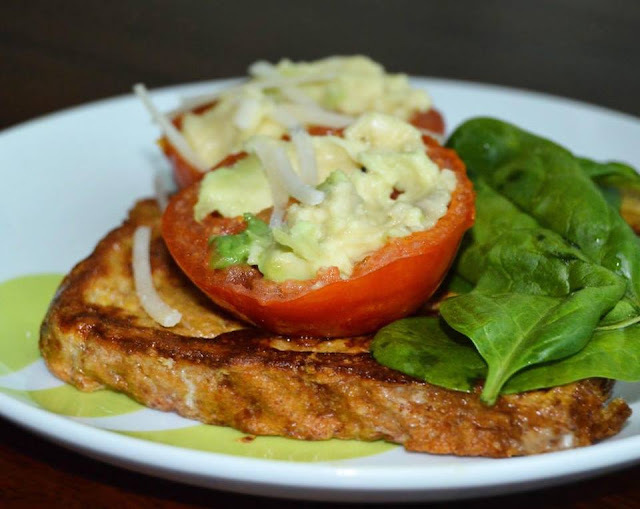 Today I am going to share with you the recipe of a delicious tomato eggy toast breakfast. Hope you enjoy it! 1. Cut the tomatoes into half and scoop out the seeds, and then put them in a small baking pan. Drizzle over some olive oil and then cook in a preheated oven 130°C for about 7 minutes until soft and golden. 2. Remove from the oven and spoon the avocado on each tomato. 3. In a small mixing bowl, beat the egg, the milk and the Parmesan cheese. Add a little salt and pepper, and then pour into a shallow dish. 4. Heat some olive oil in a medium frying pan. Dip the toasts into the egg mixture, then fry for about 4 minutes on both sides until golden. 5. Transfer the eggy toast to a serving plate. Top with the grilled tomatoes, some parmesan and the baby spinach. 5 steps of keep your hands soft & pretty!